Visitors are often struck by the unusual architecture of the Doge’s Palace and its resemblance to intricate lacework or a rich tasselled fringe. 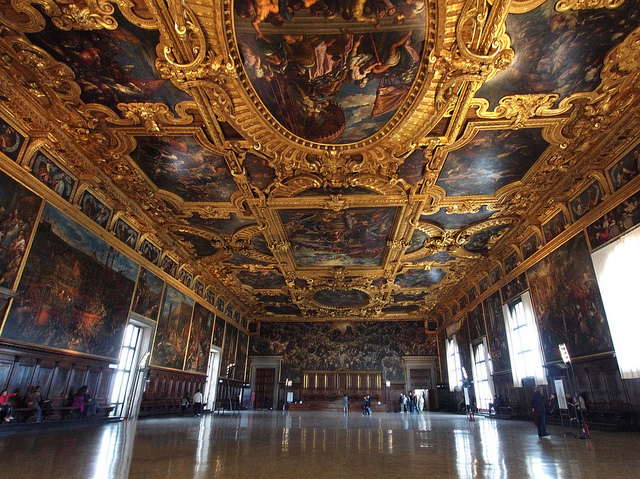 While its exterior is decorated with numerous sculptures, its interior is enriched with gilded ceilings and precious pictures so that it still maintains the glory and the wealth of the formerly powerful Venetian Republic. The residence of the head of state was next door to the council chambers and prisons: it was both the hub of power and the palace of Justice. The visitor can take a close look at the history of what was once the world’s most powerful state and can admire the paintings of some of her greatest artists: Titian, Tintoretto and Veronese. He can discover the fascinating stories of the Doges and the intrigues of government. The Doge’s apartments, the Bridge of Sighs and the prisons are also included in the tour. A visit to the Accademia allows art lovers to follow the evolution of Venetian painting from the 13th to the 18th centuries. 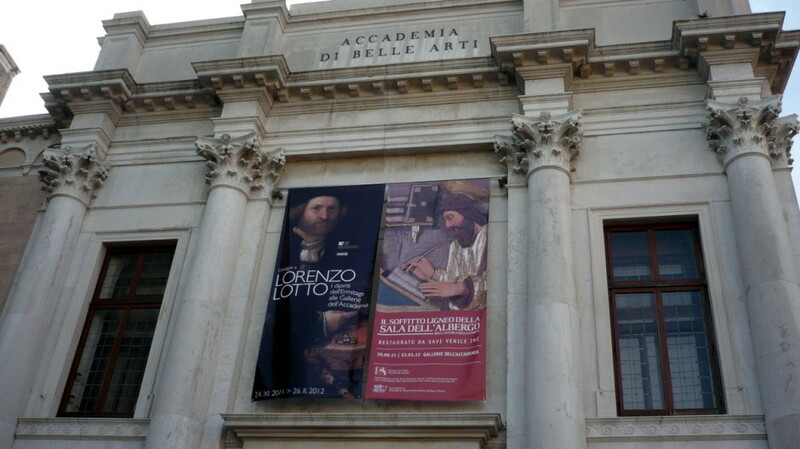 The museum contains the best collection of Venetian art in the world. Most of the paintings come from churches or scuolas or other public offices abolished by Napoleon. The museum itself is situated in the ancient church and monastery of Santa Maria della Carità, and on the site of the Scuola della Carità. Here we can appreciate Venice’s appearance through the centuries, preserved for us by her painters in works that show the city in all her glory. We will see Giorgione’s famous “Tempesta”, discover what “buffoons, drunken Germans, dwarfs and other such scurrilities" are getting up to in Veronese’s Last Supper, admire Bellini’s greatest works, and get up close to the dynamic energy of Tintoretto’s paintings. The Scuole were the principal private charitable foundations of Venice. They contributed to the long and prosperous life of the Serene Republic and provided a substitute for political activity from which the middle classes were excluded. Their buildings were architecturally magnificent, decorated internally by the greatest Venetian artists. The tour includes two Scuole – San Marco and the Scuola Dalmata. The history of independent Venice is seen in fascinating detail through the paintings of the most renowned Venetian landscape artists of the 15th and 16th centuries. This tour is designed for art lovers. It includes the Frari church, rich in sculpture of all styles and with many masterpieces of painting, and the Scuola di San Rocco, the charitable foundation of Venice where Tintoretto left his best works. We will see the tomb of Titian, deepen our understanding of the evolution of the Venetian Renaissance and discover how artists went about creating depth and capturing the vagaries of light in their paintings, giving rise to a distinctive Venetian style. The visitor can admire the works in the sites for which they were originally painted. This is an extraordinary tour that introduces the visitor to the worlds of fashion and perfume, industries in which Venice played an important role. The tour takes place in one of the aristocratic palaces of the Mocenigo family housing the Study Centre of the History of Fabrics and Costumes. The visitor can admire the many rooms of the elegant palace with its paintings, antique furniture and ceiling frescoes. Here we become acquainted with the clothing and accessories of Venetian noblemen and women through the centuries. Part of the museum is dedicated to perfumes, essences and to the natural extracts that are still used today in the production of perfume. Cà Rezzonico, formerly the home of a wealthy Venetian noble family, is one of the most delightful palaces in Venice. The palace has been furnished with 18th-century works brought from different Venetian palaces in order that the visitor can experience the authentic atmosphere of a great 18th-century house. Lacquered furniture, chinoisery decoration, the largest ballroom in Venice, porcelain, exquisite frescoes by Tiepolo and an unparalleled collection of paintings by Guardi and Canaletto combine to make your visit unforgettable.